Great news Facebook users! Well, great news for Facebook users who also have an iPhone and also have downloaded the Facebook Messenger app for iPhone. So the backstory is this, Facebook began to test the free calling over Wi-Fi and cellular data for users in Canada that had the Messenger app. Those awesome Canadian's must've not had any major issues so Facbook decided to roll it out to the good ole U.S. of A. From Facebook: "If you live in the US, you can now call other Facebook users for free over Wi-Fi or using your phone's data connection." -The call sound seems to be pretty good. Most people say it's on par with other VOIP (Voice over IP) companies, like Vonage and Skype. -Again, you have to have the app. It took me about 5 minutes to look through my friends and see if they could accept a call. 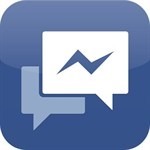 There is talk that Facebook will rollout video calling, but no official word yet. Stay tuned for the wild ride. And if you haven't already downloaded the app, here you go.